1UCL Mullard Space Science Laboratory. 2LESIA Observatoire de Paris, Meudon. 3Konkoly Observatory, Hungarian National Academy of Sciences. Filaments, or prominences — depending on your geometric perspective — are strange structures. They’re denser than the surrounding corona by an order of magnitude. They have much lower temperatures than the surrounding corona, too. One of the trickiest things to get right is how the mass is distributed in a filament, and the mass is important for a number of reasons. The role of cold material in absorbing and redistributing radiation needs to be understood to model this environment. Additionally, we want to know how much mass is weighing down this sheared/twisted magnetic structure so that we can understand its dynamics. When a magnetic instability occurs, the erupting magnetic field will take the filament and millions of tonnes of particles with it, like a typhoon through the solar wind. We’re used to radiation in the corona being optically thin, but filaments represent a different regime. They appear dark in the EUV not only because they’re cold and don’t radiate: they’re dark because of their large number of EUV-absorbing atoms and ions (also a result of the low temperature). A major part of this absorption is due to Einstein’s photoionisation effect: specifically, the photoionisation of hydrogen and helium. Note that in the X-ray range (λ < 1 Å), this absorption process doesn’t matter for filaments: the cross-section for photo-absorption, σ (Figure 1) drops off at high energy, and they become transparent . 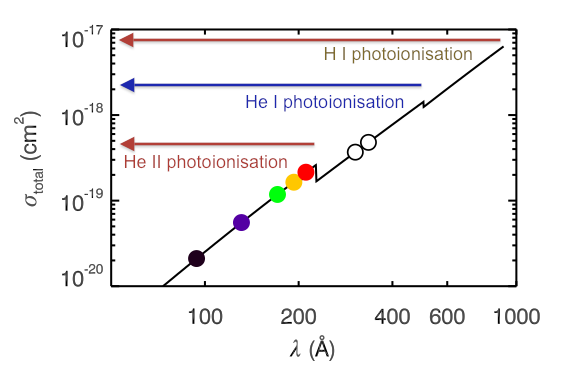 Figure 1: An estimated total cross-section for photon absorption due to photoionisation. The function is a continuum, with three distinct edges at 912, 504 and 227 Å: shorter than these wavelengths, H I, He I, and He II (respectively) ionise through photon capture. Coloured circles show the nominal wavelengths for each AIA channel we analyse. The 304 and 335 Å channels (empty circles) are not used. This effect in filaments can actually give us an estimate of how much mass they contain. If we know how much radiation comes from the foreground and background along the line of sight, we can work out how much mass the filament contains. (A simplifying assumption is that the filament material itself doesn’t radiate.) Since along a single line of sight we can’t actually see behind the filament, we can either model the background radiation field, or observe the unobscured corona once the filament erupts. These have been done at single wavelengths using TRACE (in the former case) and SoHO/EIT (in both the former and latter). Lines of sight effectively have a finite thickness (assumed equal to the pixel dimension), so we can perform this absorption calculation in each pixel of a filter or spectral-slit image. The traditional advantage of using spectral data over filter-image data is that we can vary the wavelength of light used, and the opacity will only change because of the variation in σ; the total amount of H and He won’t change. With the added information that spectroscopy brings, it is possible to estimate not only the amount of mass along the optical path, but also pixel-area filling factor, to determine how much hidden structure is inside a single pixel! However, the disadvantage is that we typically only have simultaneous measurements along the slit before it steps to the next position. Even if we assume the filament doesn’t change, it’s a time-consuming process. We’ve really entered a new era with SDO. AIA takes images in a number of EUV wavelengths so quickly that they’re almost simultaneous. We have (nearly) co-temporal, quasi-spectroscopic data across the whole Sun. 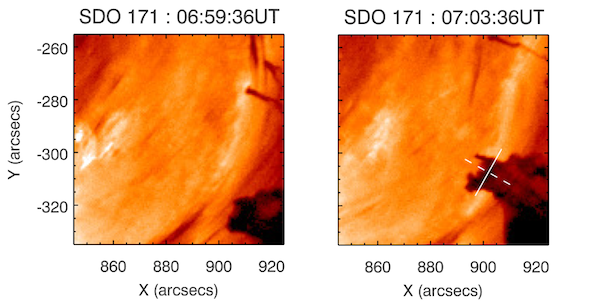 It’s suddenly possible to estimate the mass in filament material, including the filling factor, in each AIA pixel, anywhere on this side of the Sun! In the best-case scenario, we’re even be able to compare the obscured and unobscured radiation fields. A perfect opportunity to test this idea came with the dense “blobs” of material that fell back to the Sun in the beautiful prominence eruption on 7th June 2011. Figure 2 shows one such blob falling back to the Sun. Figure 2: A blob of dense filament material, which didn’t quite escape, falls back to the Sun from lower right towards the centre of field. The left panel shows the image used to represent the foreground and unobscured background. Solid and dashed lines are fiducial marks for comparison with the maps in Figure 3. 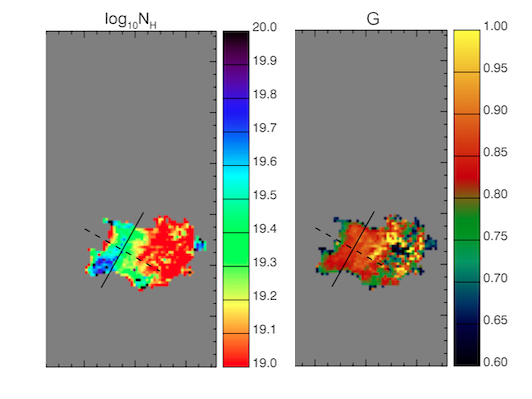 To estimate filling factor and column density of hydrogen in this blob, we need to measure the amount of obscuration at multiple wavelengths . The amount of absorption is proportional to the amount of hydrogen present, which is a constant, but also depends on the absorption cross-section, which is a function of wavelength. Since we have multiple AIA wavelenths, and we know the cross-section’s function of wavelength, we can calculate a best-fit map of the column density and filling factor. This function multiplies the filling factor and ratio of background-to-total radiation into a geometric factor, G, also shown in Figure 3. What we notice is that there’s a good degree of resolved structure in this dense blob (left panel), but the pixel filling factor must be close to unity because G (right panel) is also close to unity. Figure 3: Best-fit maps of neutral hydrogen column density (cm-2) and geometric factor G (see text) resulting from our analysis. We’ve road-tested a method for determining filament/prominence masses using AIA in a quasi-spectroscopic mode. The method yields sensible numbers when we compare with filaments on the Sun. But crucially it shows a lot of promise because since it works with AIA data, we should be able to create mass-maps of all filaments, all the time! For more details that we didn’t go into here, see  which is currently in review for ApJ, or comment below.